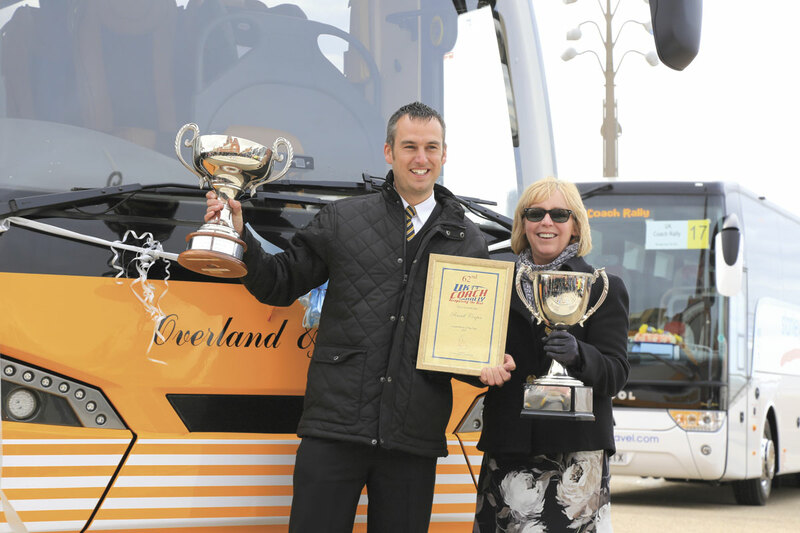 One of the most surprised people at the conclusion of this year’s UK Coach Rally in Blackpool was Dave Parry when he received the Coach of the Year award for the sixth year in succession. 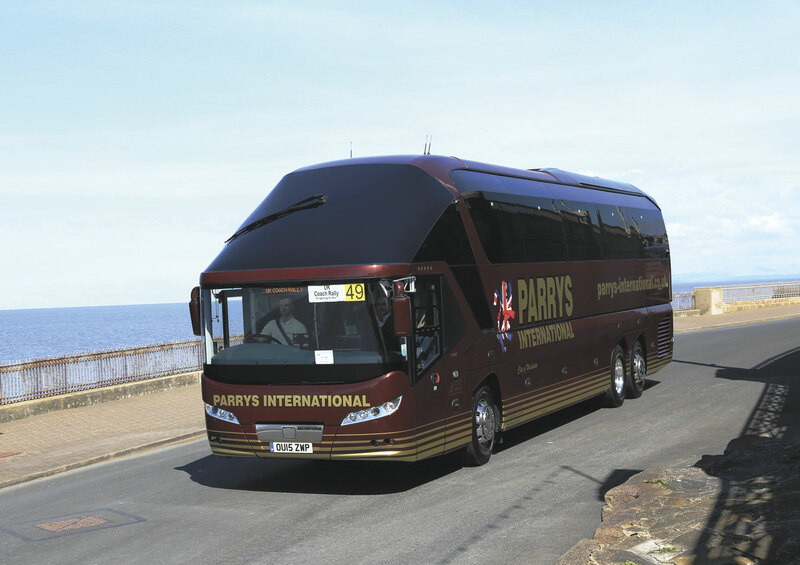 Parrys International Tours’ 2015 Neoplan Starliner, the last one built for the UK, was entered when it became clear that the company’s next generation of coaches would not be ready in time. Parrys’ standard of presentation and the vehicle’s distinctive features ensured it took the closely contested title. 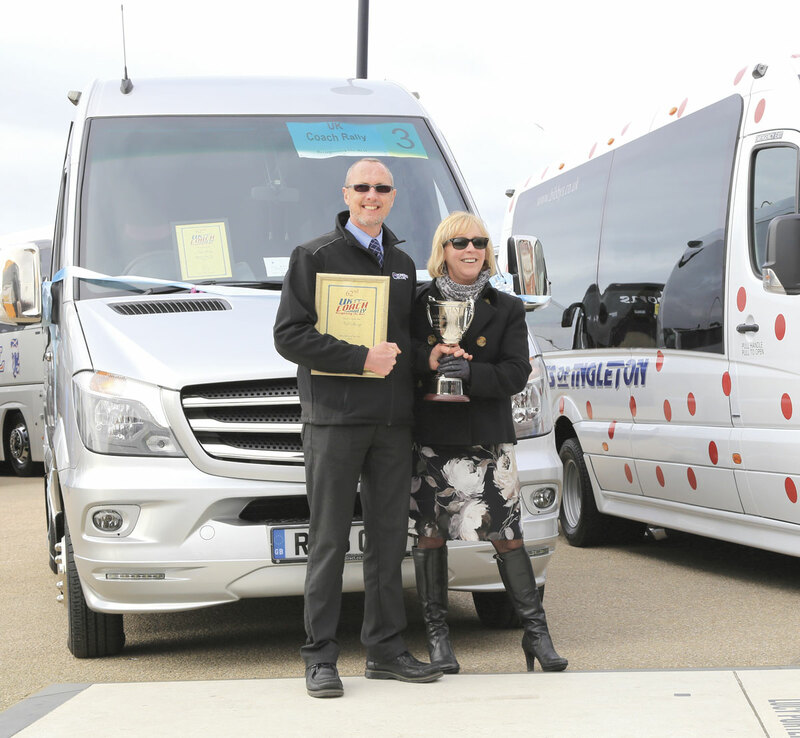 There was success for another regular UK Coach Rally entrant as Russell Cooper of Rotherham based Coopers Tours took the Coach Driver of the Year title for the first time in the UK’s initial TAM Vive TH. Runner up was Matthew Haynes of Banstead Coaches in a new Temsa Safari HD, another regular competitor and previous winner. Midi Driver of the Year was Gabi Scott from Stanley Travel driving a Yutong TC9 whilst Neil Sharp of Homeward Bound took the Mini Driver of the Year title in an EVM Sprinter. 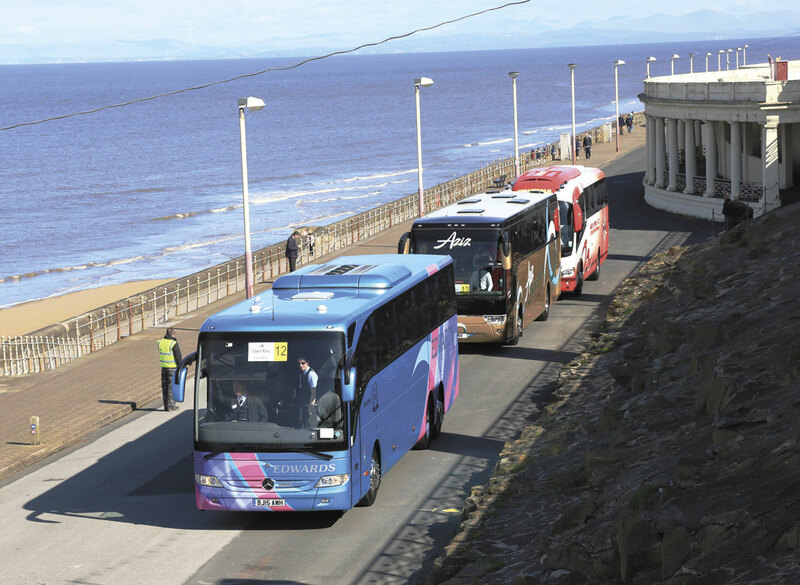 After sojourns in Peterborough and Alton Towers, returning to the seaside at Blackpool felt like a homecoming for the UK Coach Rally with its Brighton seafront roots. 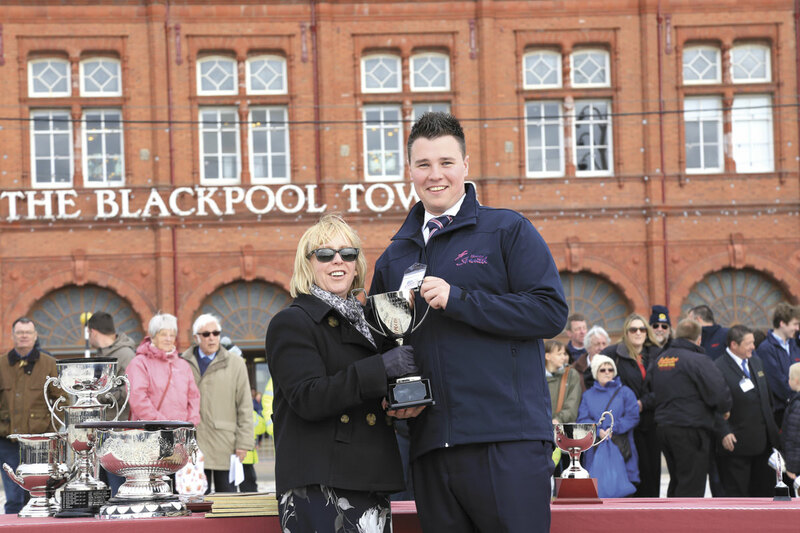 Blackpool itself is no stranger to coach rallies having hosted its own competing event for a number of years, finishing around a quarter of a century ago. 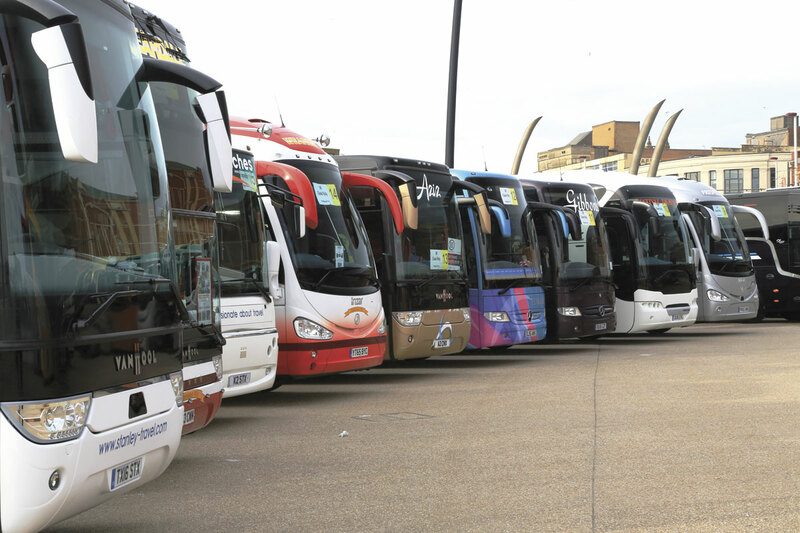 Then the Blackpool event was the National Coach Rally and the Brighton event was the UK Coach Rally so perhaps people will now stop referring to the current event as the Brighton Rally! 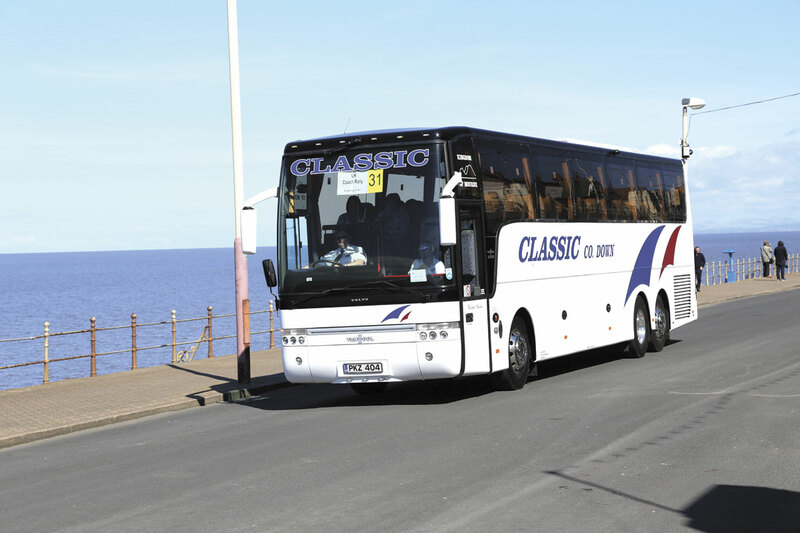 Rally organisers Coach Displays Ltd worked with Visit Blackpool and the Merlin Group, managers of the Blackpool Tower complex, to ensure a fresh approach which retained all the traditional elements of the weekend. 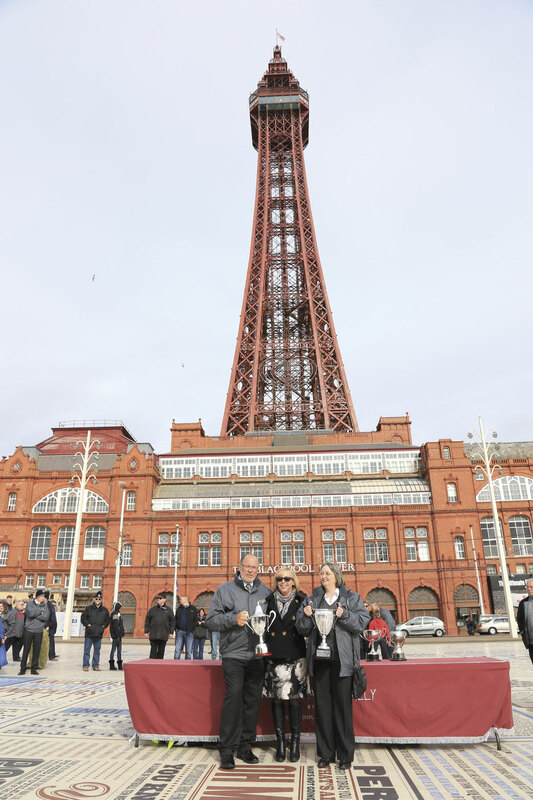 Blackpool has also been reinventing itself over recent years to provide more space on the Promenade including the Comedy Carpet in front of Blackpool Tower that provided the centrepiece for Sunday’s judging and awards activities. Driving tests and trade displays occupied the area around North Pier on the seaward side of the Metropole Hotel, a short walk from the Tower area. The new location appeared to capture the imagination as soon as it was launched and a full house of 50 entrants was achieved quite early. A waiting list ensured that there were actually 50 on the day albeit with at least one change in the actual vehicle entered. Entrants were drawn from all corners of the UK, including Northern Ireland represented by Classic of Newry. 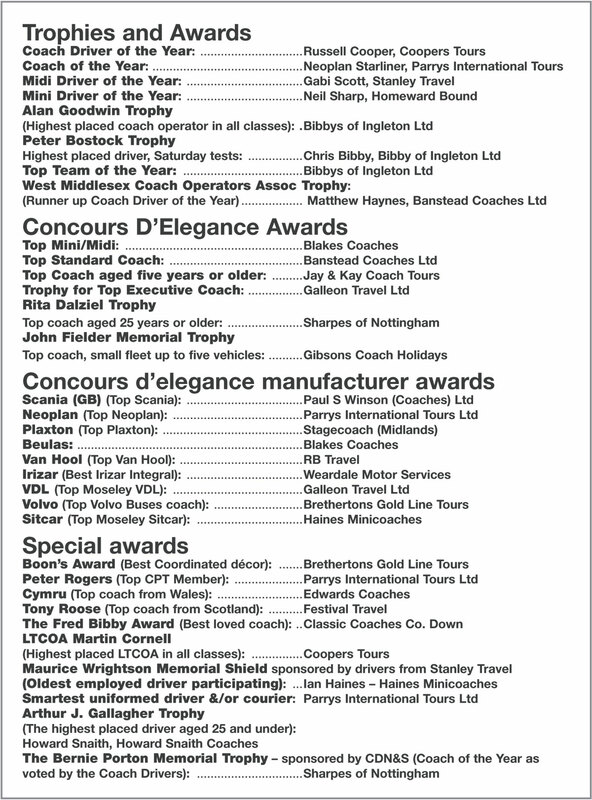 Alongside many regular entrants, there were a number of new faces including Birmingham’s Aziz Coach Service, Bretherton’s Gold Line Tours of Preston and Festival Travel of Kirkliston. 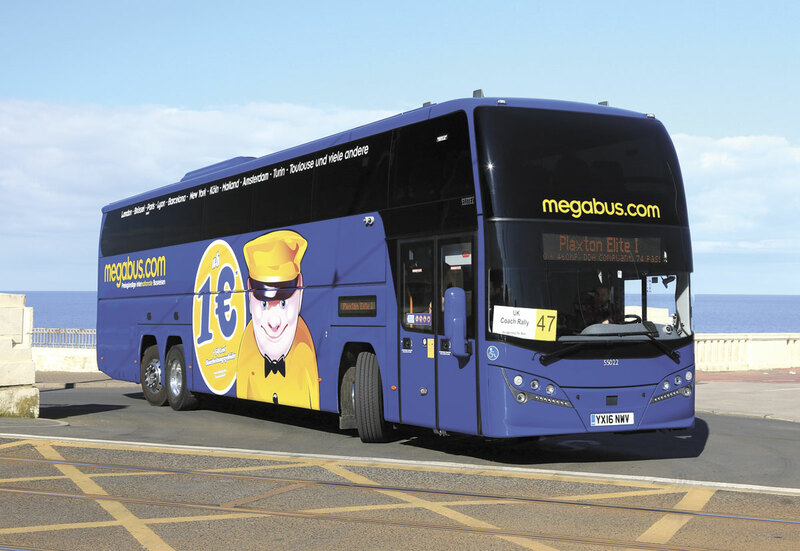 The vehicle entry list covered much of the current market spectrum from a number of 16 seat Sprinter minibuses to the 75 seat Plaxton Elitei bodied Volvo from Stagecoach’s Megabus operation. There was a small number of heritage vehicles, the oldest being Webbs Coaches recently restored petrol engined Bedford OB from Stratford on Avon. Sharpes of Nottingham’s 1987 Volvo B10M with Van Hool bodywork and manual gearbox attracted a lot of attention, the combination being seen as the ‘ultimate workhorse’ of the coaching industry for many years. That Van Hool’s designs have evolved rather than changed over the past 20 years was demonstrated by Aziz Coaches’ 1999 Scania based T9. 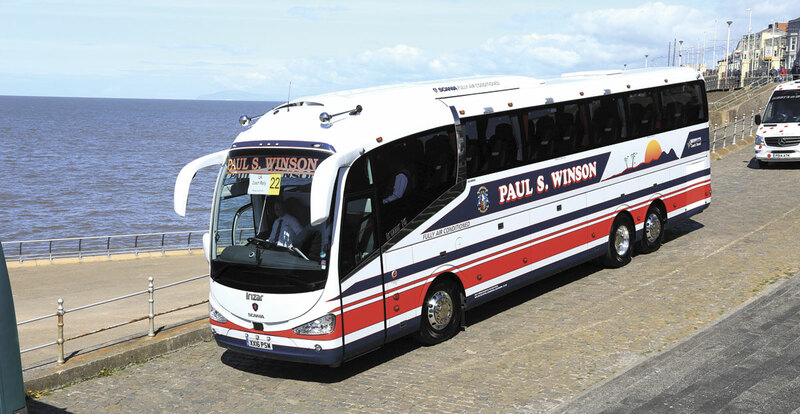 This has been updated by Blackpool Coach Services with TX front and rear panels and side trim. The Trade also recognised that the new location presented more opportunities and supported the Rally accordingly. Saturday morning brought blue skies and sunshine which lasted most of the day although the stiffening breeze unfortunately kept the temperature down. The road run got off to a prompt start from Middle Walk below the Promenade. At the Gynn Square end of this, drivers faced their first challenge with the kerbline and road markings not emphasising the need to cross the paved tramlines at this point. At least one entrant was seen to start heading up the tramway until realising that the approaching station was unsuitable for coaches. The road run took entrants into Blackpool’s hinterland towards Fleetwood and was of sufficient duration to ensure all participants had departed before the first returned. The route obviously presented a challenge to some entrants who returned significantly later than expected, not forgetting one entrant who managed to return to Middle Walk from the wrong direction! Middle Walk provided a convenient holding area in advance of the afternoon’s driving test at the next level down, approached by a steep incline which provided a good challenge for any vehicle’s parking brake. The driving test itself consisted of six elements with a maximum allowed time of six minutes. After the driving test, entrants made their way to the display area in front of the Tower. With vehicles either side of the Metropole throughout most of the day, a steady stream of visitors through the trade displays was encouraged. On Saturday evening, the customary dinner dance was held in the Tower Ballroom generating positive feedback from all those who attended. The famous sprung dance floor from ‘Strictly Come Dancing’ with added dance tuition and the music of the organ proving particular attractions. Sunday dawned rather grey but most of the forecast rain stayed away and the day gradually brightened, the one shower of note being timed to ensure that some of the judges (including both writers of this article) received a wetting. 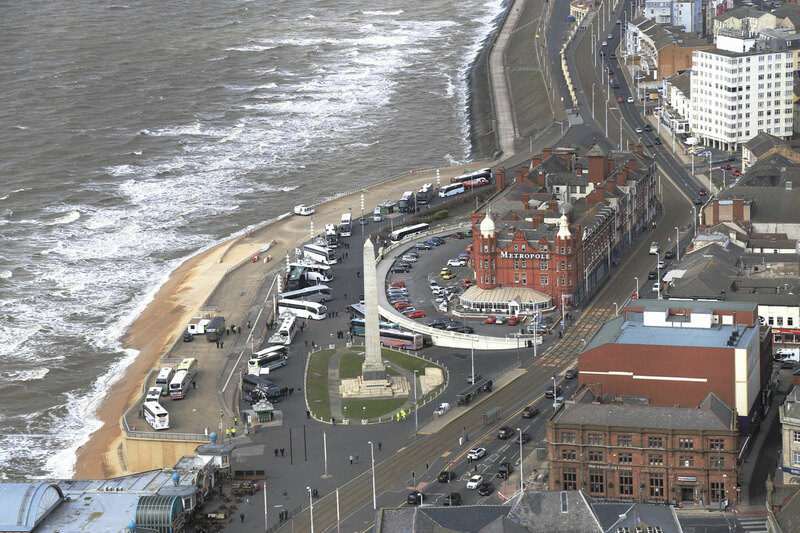 The morning’s activities were complicated by the closure of the main road along the Promenade for Blackpool’s marathon run. 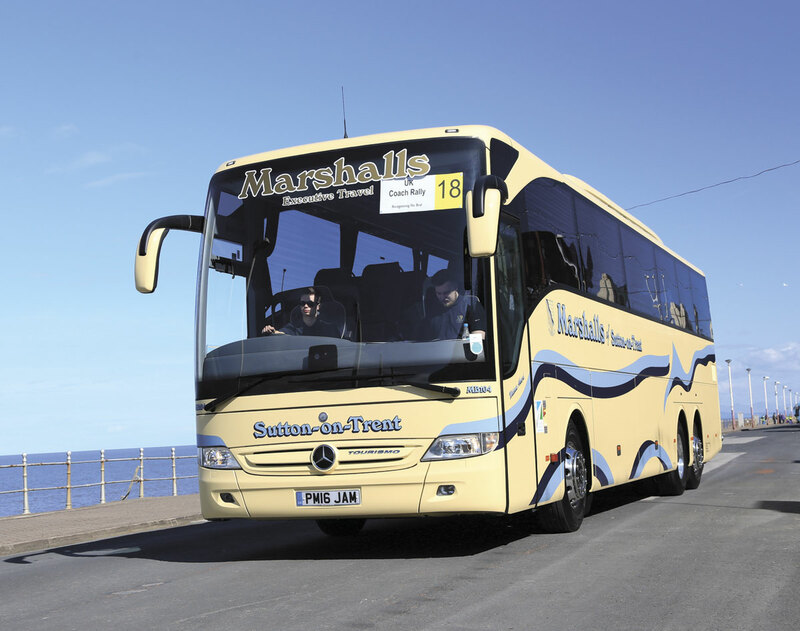 Coaches participating in the final driving tests had to be escorted along the seaward side and onto the tramway to reach the test area, manoeuvres accomplished safely with the support of marshals and the Blackpool team. With a full house of 50 vehicles, the Concours d’Elegance judges were kept busy and tensions started to rise in advance of the winners being announced. 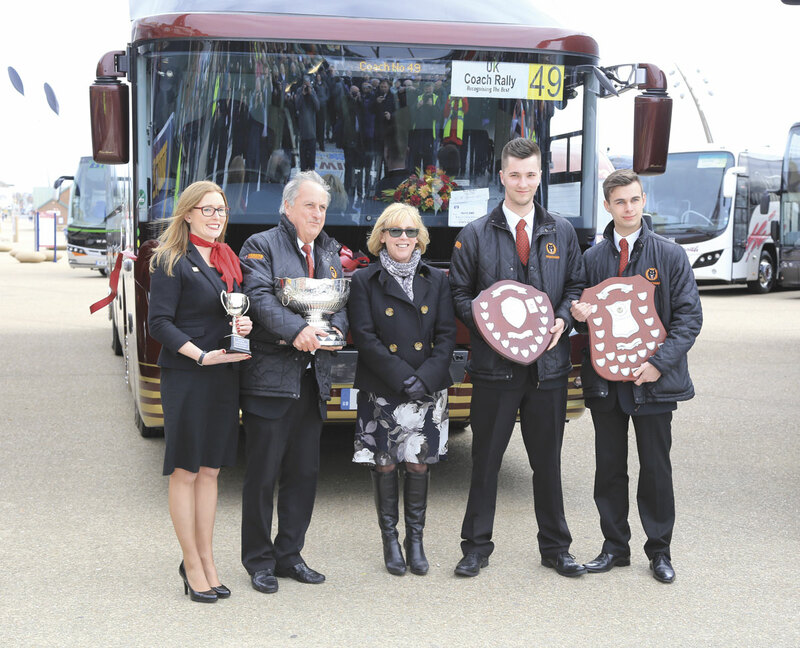 Whilst the final results were being assessed, the Directors Challenge took place in the driving test area, Paul Winson of Paul S Winson Coaches, a former Coach Driver of the Year, proving successful. With a slight delay, the trophy table was set up on the Comedy Carpet ready for the presentation of awards by Senior Traffic Commissioner, Beverley Bell. Vehicles are not allowed on the Comedy Carpet so the Tower formed the backdrop to most of the well attended conclusion to the weekend’s events. For the top awards, the crowd migrated to the vehicles concerned which had been discretely decorated with ribbons. These presentations took place out of the order perhaps expected so initially Parry’s sixth consecutive win was a low key affair. 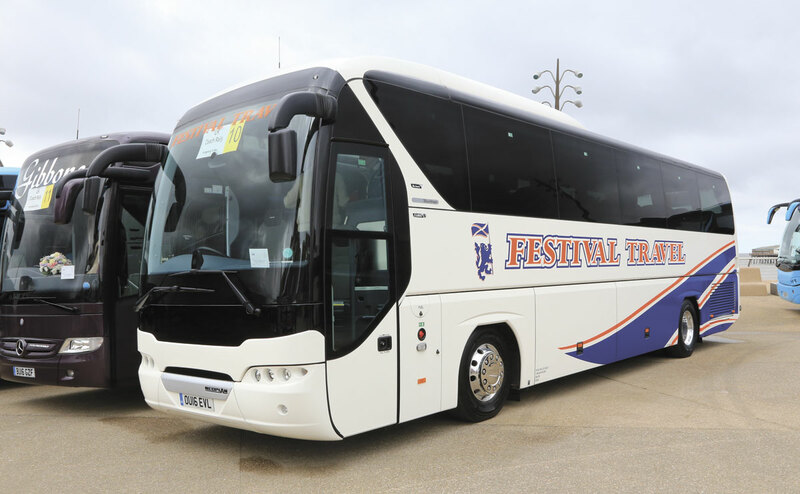 As previewed in detail in Bus and Coach Buyer 1374 (15 April 2016), the Rally was supported by a wide ranging display of current models available from most of the UK based dealerships. The vehicles displayed were mainly as expected with just a couple of additions and changes. The space available allowed vehicles to be displayed with reasonable circulation space and provide something of a wind break for the north westerly breeze which developed during the afternoon. Only manufacturers/dealers supporting the event are permitted to present manufacturer’s trophies for the Concours event. Pelican Bus and Coach’s main exhibit was a 35 seat Yutong TC9 Euro6 touring coach powered by a Cummins ISB6.7 engine delivering 280hp coupled to a ZF 6AP1200B automatic gearbox. Additionally, KM Travel brought along a recently delivered Yutong TC12 on behalf of Pelican. 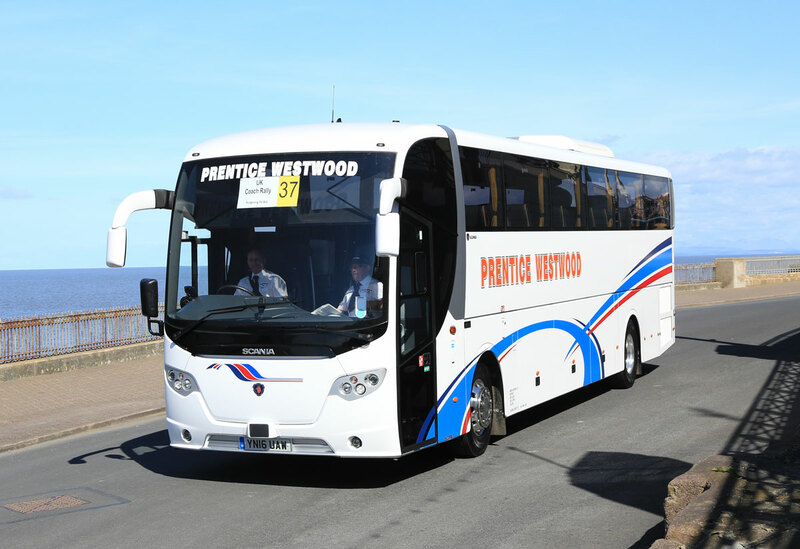 This 49 seat plus toilet vehicle was powered by a Paccar DAF MX11 engine with ZF transmission. The KM team spoke positively of the support from Pelican and the acceptance of feedback by Yutong which has led to a number of design changes including the provision of a cut out in the decency shield behind the centre steps to provide additional space for a foot rest. 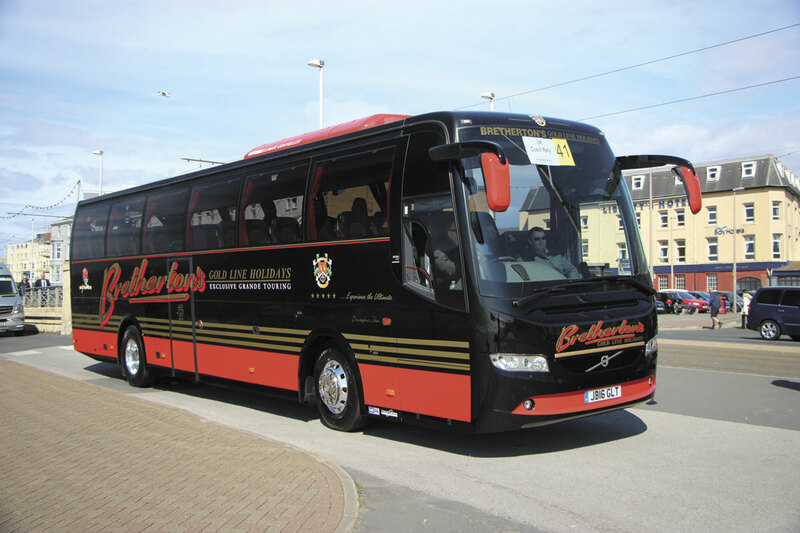 Arriva Bus and Coach Ltd brought along examples of both Van Hool ranges in matching colour schemes. 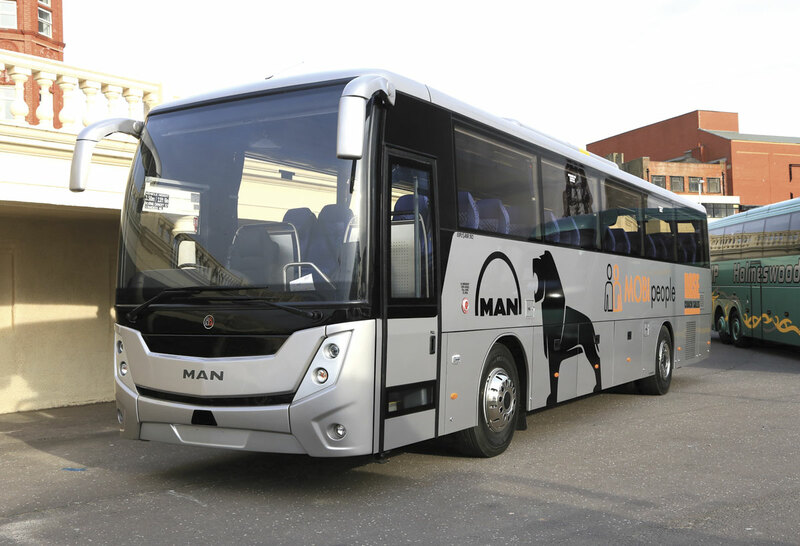 The Macedonian built EX16H shown had 57 Kiel Avance 2010 seats and is powered by a Paccar DAF MX11.320 Euro6 engine matched to a ZF EcoLife transmission. In contrast, the Belgian built tri-axle TX17 Astron was a 59 seat vehicle powered by a Paccar DAF MX13 340 Euro6 engine matched to a ZF AS-Tronic gearbox. There was a last minute change to Volvo Bus and Coach’s exhibit. 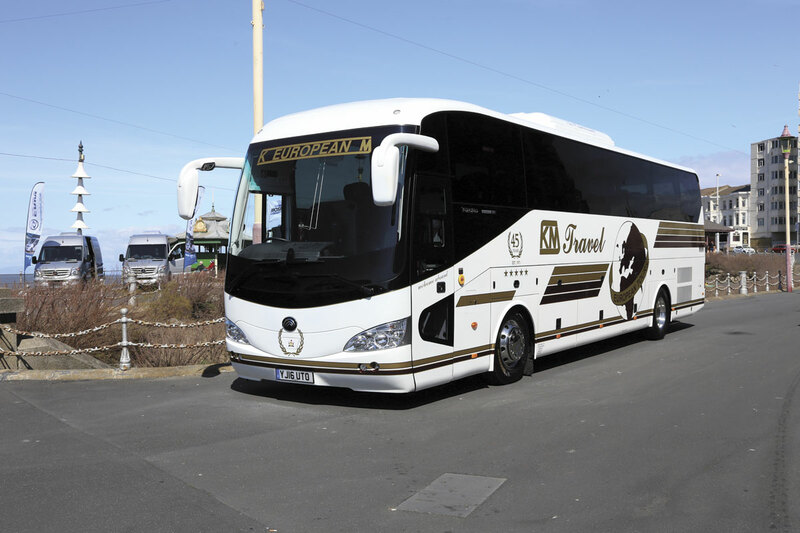 The dealer brought along a stock 12.57m Volvo B11R with Jonckheere JHV 53 seat coachwork. It was equipped with the optional ZF automatic gearbox and 380bhp engine combination. MAN Truck and Bus had their towels down early in the seafront shelter adjacent to their display vehicle. 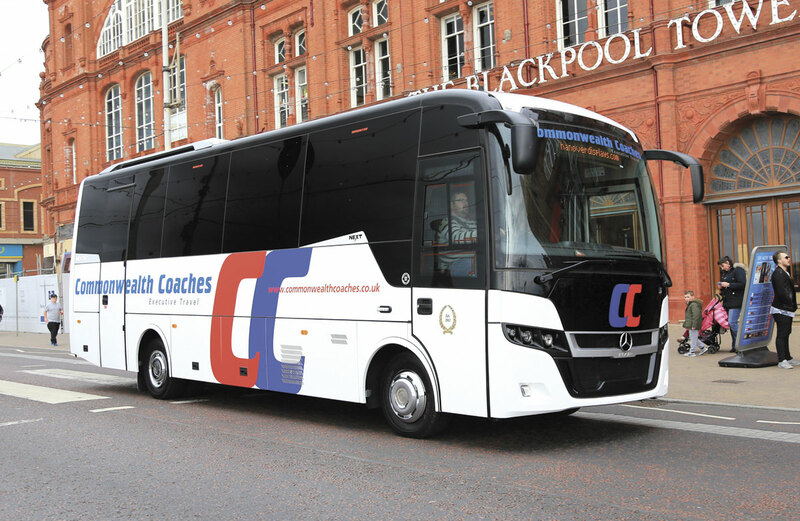 General Manager Bus and Coach, Paul Gardner and his team were promoting the Neoplan Tourliner Select package which offers a £50,000 price advantage in comparison to the VIP package by a reduction in specification such as a lower 440bhp engine rating, no alloy wheels and alternative seats. This puts a two axle 12m model at a retail price of £200,000. MAN have been careful to ensure that the changes should not impact on residual values of the VIP level models. Already 20 Select examples have been sold and 15 further examples to three lengths are on order. The displayed vehicle was a 13.2m P20 three-axle example with centre toilet, 55 recliners and extras including alloy wheels and additional carpets. 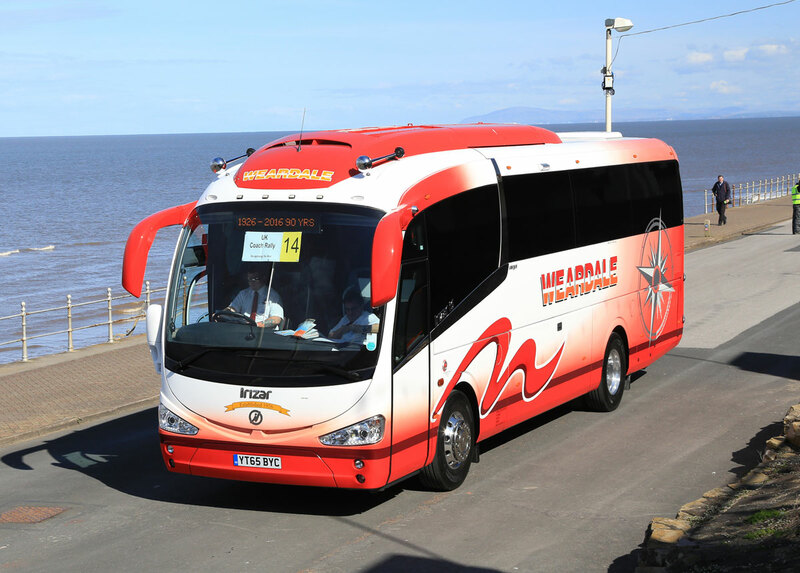 It is due to be delivered to Bryans Coaches of Denny near Falkirk immediately after the show, their first Neoplan. Paul Gardner also advised that MAN was experiencing success in the chassis market, supplying 125 chassis to the UK in the past year. 75 of these were the TGX truck chassis for midi applications, particularly through BASE and Nu-Track. Appropriately, BASE Coach Sales displayed three MAN based vehicles opposite the MAN team. 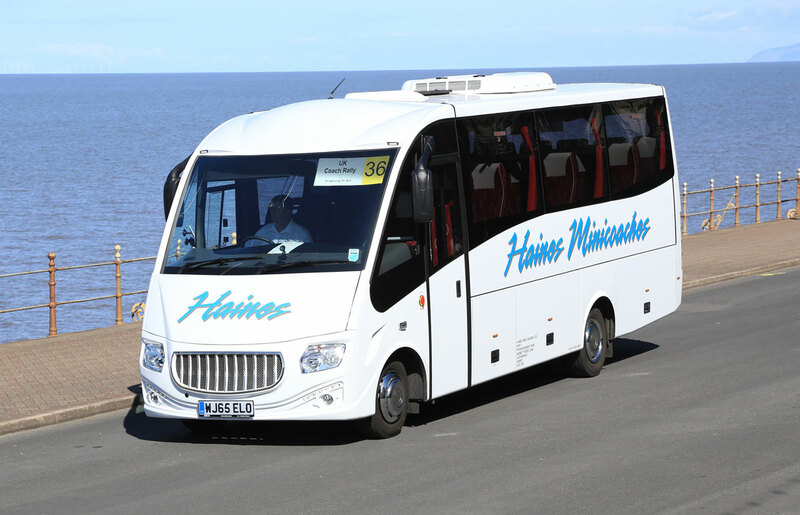 Two featured wheelchair accessible Barbi Galileo coachwork, an HDH 13.8m based on an RR4 chassis for the Holmeswood fleet and an HDL 12.4m on an RR2 chassis for Anthonys Travel. BASE confirmed that the 11th Barbi coach for the UK has just gone into build with two further chassis on order to accept Barbi coachwork. The third BASE vehicle was a 12.5m MobiPeople Explorer stock vehicle on an RR8 chassis. 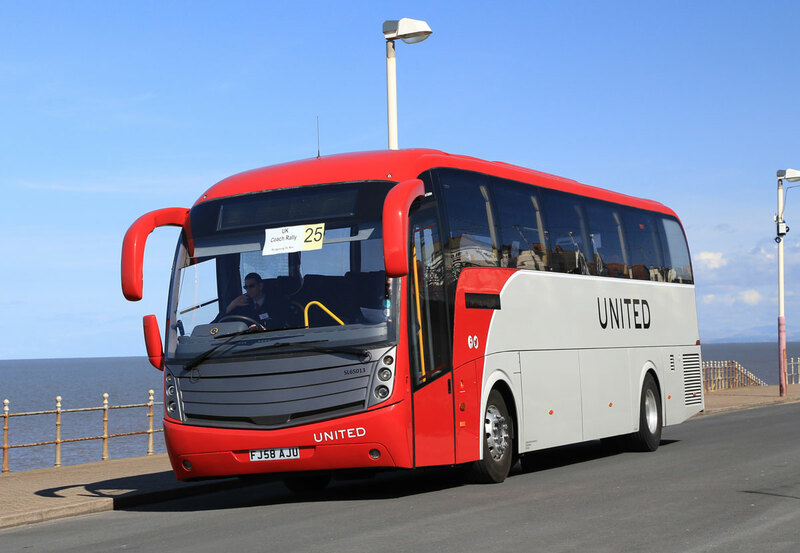 The 12.5m version with 74 seats plus courier has now been successfully tilted and is offered at a net figure of £170,000. Over 40 MobiPeople bodied MAN vehicles have been supplied so far by BASE. Scania’s hospitality unit was a popular spot out of the breeze on the Saturday afternoon as the sun streamed in through the windows overlooking the driving test area. Exhibited alongside was a 49 seat 12.1m Scania Touring based on the K360 IB 4×2 chassis. 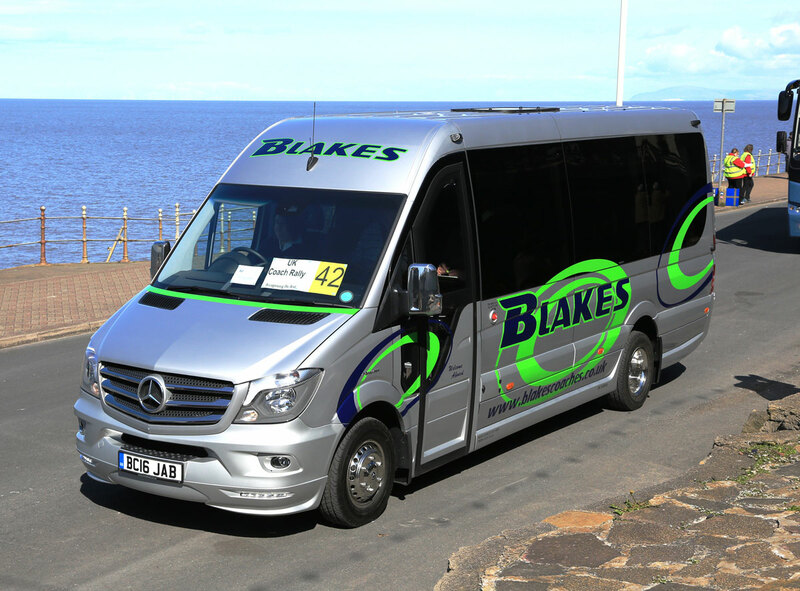 Five vehicles were shown by the associated Moseley companies: a 59 seat 13.2m MAN RR4 based Beulas Glory for Weardale Motor Services; a 57 seat 12.9m VDL Futura FHD2 for Mortons Travel; a 53 seat 13.2m Van Hool TX16 Acron for Berkeley Coaches; a Mercedes-Benz Atego based Indcar Next for Commonwealth Coaches and a 25 seat Iveco 70C17 Sitcar Voyager. 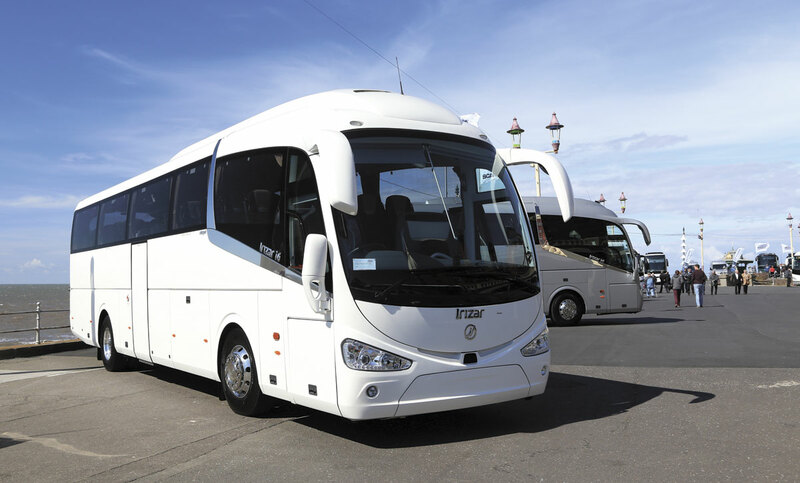 Irizar UK presented two i6 integrals, a 13.2m tri-axle with 53 i6 Lux slide-out seats and a 12.2m 49 seat tourer, both powered by Paccar DAF engines through ZF transmissions. 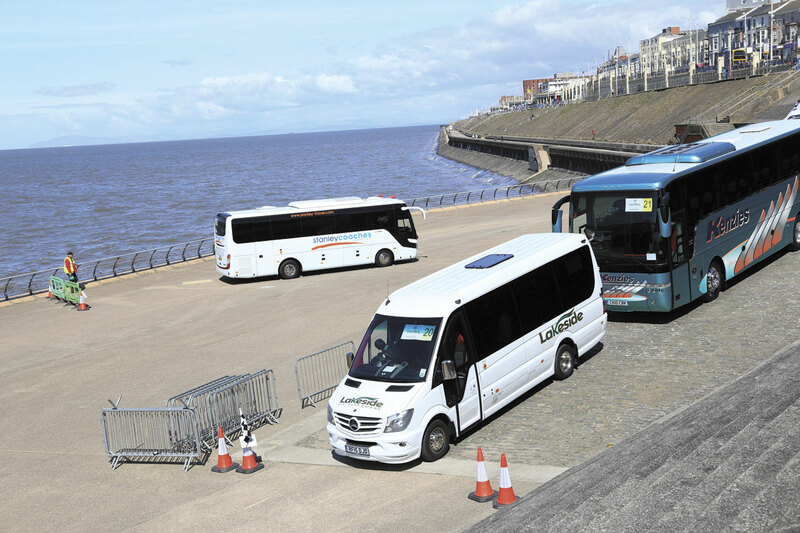 The Plaxton display close to North Pier included three vehicles. The Rally was the first public showing for the Panther Exec model based on Volvo’s B8R chassis offering 57 seats plus a toilet on a two axle chassis though shown with 53 plus toilet. A maximum capacity of 61 is possible and the retail price is £238,000. 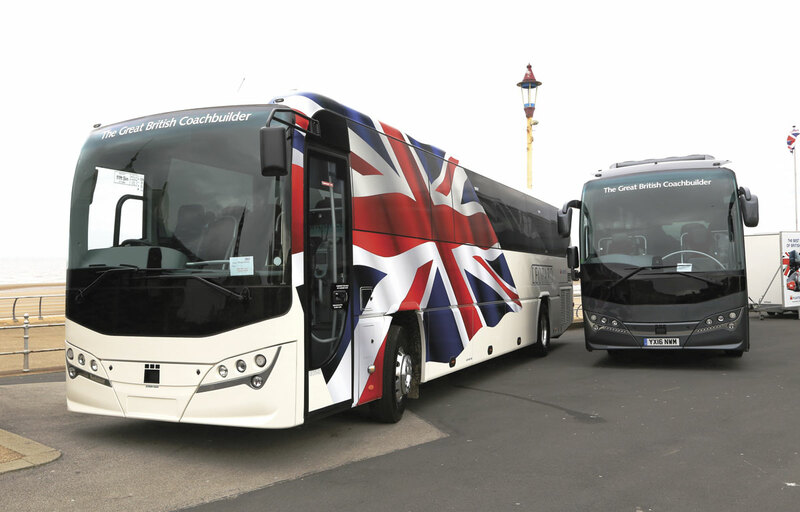 The demonstration vehicle has greyscale union jack graphics. Similar graphics in full colour were applied to the Leopard provided to the Rally organiser’s to assist with setting the Rally set up. This had 57 Brusa recliners and a retail price figure of £220,000. Plaxton’s third exhibit was a Plaxton Cheetah for York Pullman finished in the livery of its Ingleby’s of York operation. Cheetah now offers 36 seats plus courier and a 230hp engine, retailing at £161,300. EVM Direct were a late addition to the trade display with two Mercedes-Benz Sprinter based minibuses featuring alternative entrance, glazing and seating options. One was a Trend based on the 316Cdi with ten leather seats, the other a 16 leather seated Elegance based on the 516Cdi and destined for Dawsonrentals. In addition to the trade support, the rally was sponsored by Arthur J. Gallagher and LTCOA (London Tourist Coach Operators Association). Whilst everyone wished the weather had been warmer, the overall feedback on the rally’s new location was very positive. There were a number of encouraging comments from the trade on the interaction opportunities and a feeling that the rally was back on track. Participants were also positive with both the rally and the location which provided more opportunities for accompanying family and friends. In what is still seen by many as an ageing industry, it was particularly encouraging to see a significant number of younger participants in the Rally. Many of them represent the next generation for family businesses and all showed a passion for excellent service that bodes well for the future. As with any location there are things that could be improved, lack of toilets was mentioned several times although this seems a general issue for the town and those that are there often give the impression of being disabled radar key only until a closer look identifies the 20p slot. 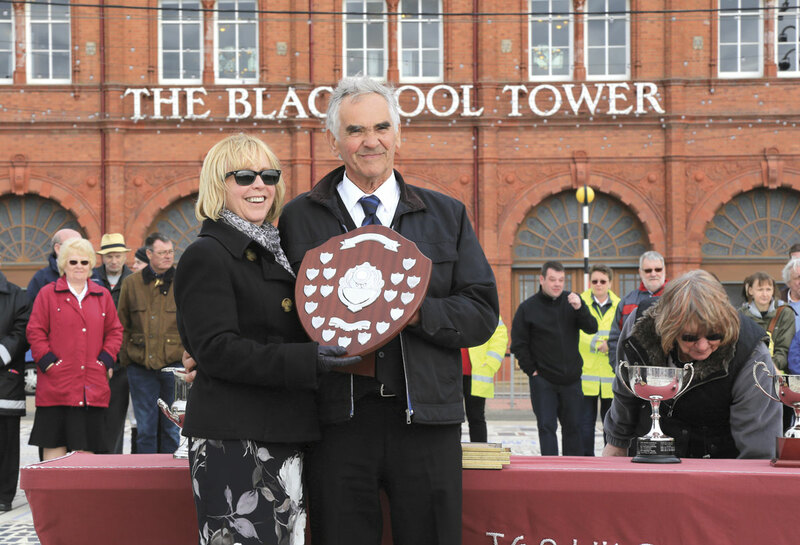 The concurrent staging of the Blackpool Marathon on the Sunday morning caused few if any issues and throughout the marshals worked hard to ensure the event was safe as vehicles and visitors often had to cross the adjacent tramway. Many older visitors’ awareness was heightened as they recalled the untimely demise of Coronation Street’s Alan Bradley in 1989. The Rally was a busy weekend that seemed to go extremely quickly and smoothly. With the experience gained this year, 2017’s event which is to be held over the last April weekend (29th/30th) promises to be even better.